One of the things I really want to try to focus on more with this column is the world of independent comics. We live in an age when things can be seen and heard without the sponsorship of big, multi-media corporations; no longer are they the gatekeepers. That said, with a leveled playing field across the board how do you make your vision stand out and attract the attention of the millions of web users whose attention everyone else is also vying? It takes everyone who is interested in something, everyone who sees something they think others will like to spread the word and help make these projects happen. SCB: Last year Joe and I did a little article to talk about the end of the penultimate season of Breaking Bad. This year though there’s quite a bit more invested. This year we are here to say goodbye to what is, for my money, the greatest show in the history of shows. If you’ve not seen Breaking Bad all the way through I beg you, click off this article because SPOILERS. Comic Book Interlude: Kickstarter for The Painted Ladies of San Quentin B&W Edition! There has been a lot of activity coming from the Ministry camp as of late. Admittedly iconic mastermind of the band Al Jourgensen released an autobiography, a new and very possibly final album and now… a comic book? In a press release I received this past Wednesday Uncle Al announced a partnership with British artist Sam Shearon who will write and illustrate Ministry: The Devil’s Chord, a thirteen-issue comic book series that will transmogrify Alain from mere flesh and blood mortal into a comic book character based on the evolution of the band he has helmed for over three decades now. Shortly after Grant Morrison’s seven year run on Batman ended Kevin Smith had Mr. Morrison return to his Fatman on Batman podcast. I’m a fan of Smith’s, howevert although I listen to his Hollywood Babble-On podcast with Ralph Garman religiously (funniest podcast EVER) I rarely listen to any of the other scores of podcasts the man does. It’s not that they don’t interest me because frankly I find Smith to be one of the most urbane and intelligent speakers I’ve ever heard, and if he wanted to talk about fleshlights and oreos for two hours I’d be all ears. No, it’s just a time thing. Time, and I’m a music addict, so nine times out of ten I’d much rather listen to music than anyone talk. 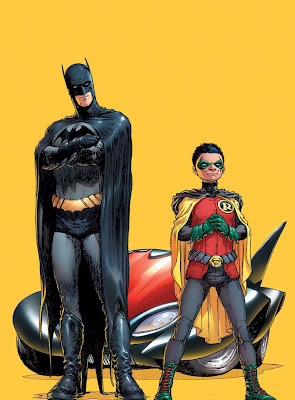 That said, anytime someone interviews Grant Morrison I am there, and the first two-part interview Smith (here and here) conducted with Morrison on Fatman on Batman was so fantastic that upon seeing the new one I dropped everything I was doing and listened. Ahhh, the movie Dredd. Written by Alex Garland and starring he-who-should-have-been-the-new-Batman Karl Urban, Dredd is quite a work of comic book adaptation art. If you have not seen it, you should – I’d easily call it one of the best comic book movies to date. Bold statement? Yep. But one that I stand behind.